ea. pc. 1 3/16-1 1/4 x 1 3/16-1 1/4 x 4 1/2"
ea. pc. 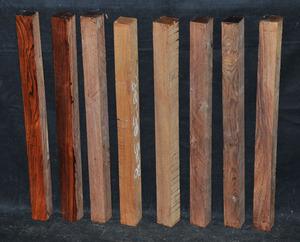 1/2 x 7/8 x 4 3/8"
An assortment of woods with interesting grains, colors, and densities. 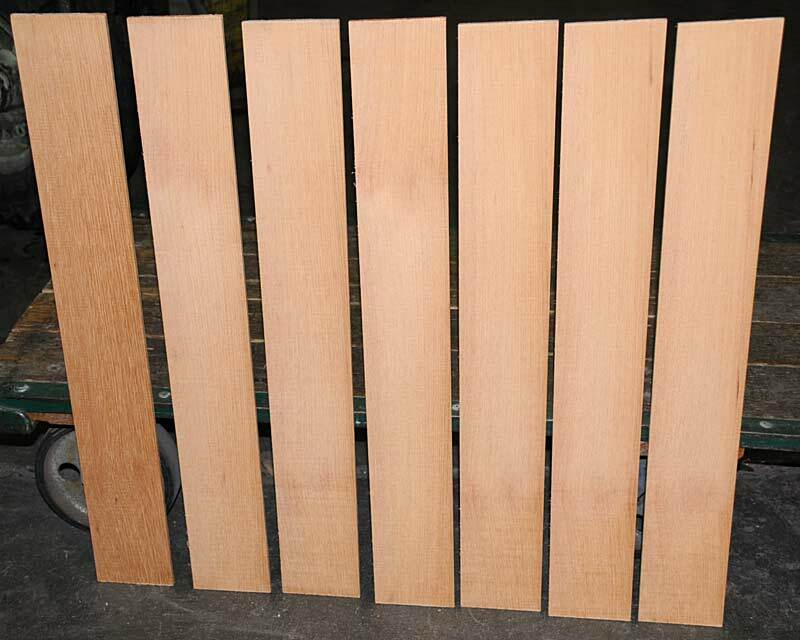 Perfect for inlays, laminations, jewelry boxes, knife handles, etc. Species listed below are shown left to right in the photograph. Beefwood - A hard and heavy reddish-brown wood from South America. 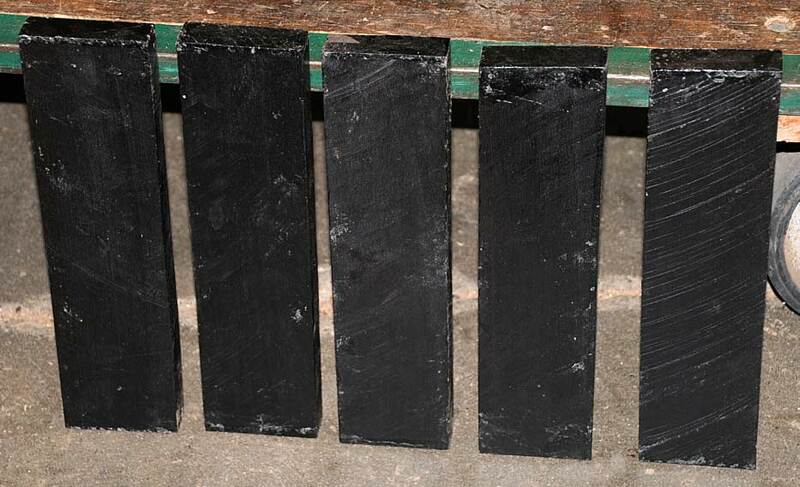 3/4-1 x 4 1/2-5 x 5 1/2-8"
Striped Ebony - A true ebony from Indonesia, not too hard to work and takes a beautiful finish. 1 x 2 1/2 x 10". 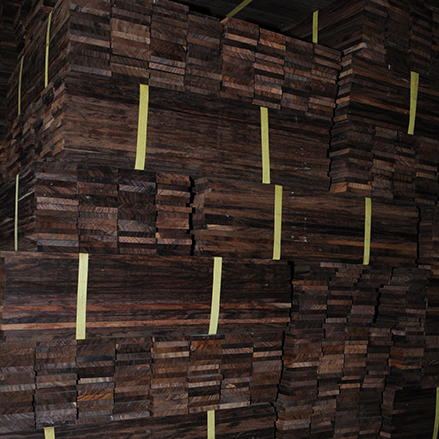 Teak - Plantation grown. 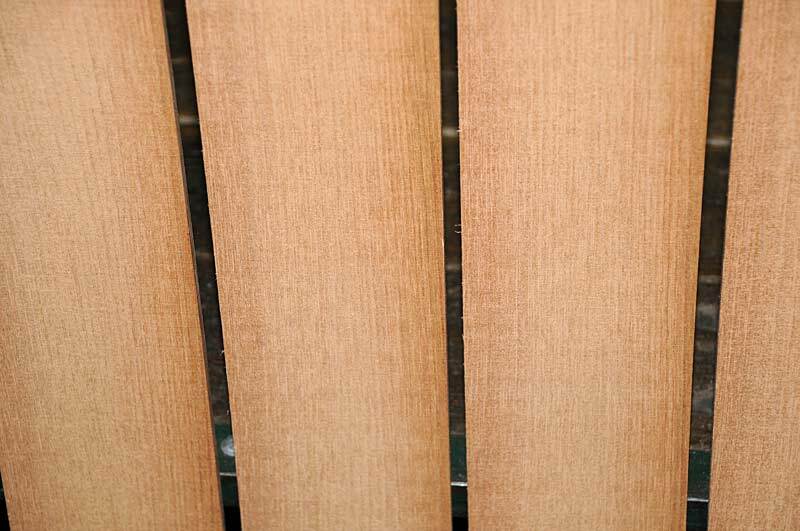 WIth an oil finish, gives a rich appearance. 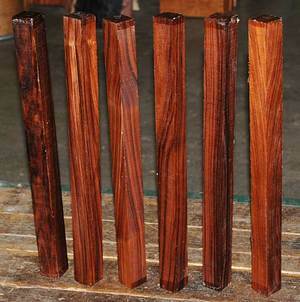 3/4 x 3 1/2 x 13 1/2-14"
Cocobolo - This Mexican species is one of the worlds most beautiful woods. Hard and heavy and takes a glassy smooth finish. 5/16-3/8 x 2 5/8-2 3/4 x 19 1/2-20"
East Indian Rosewood - Plantation grown in Indonesia. 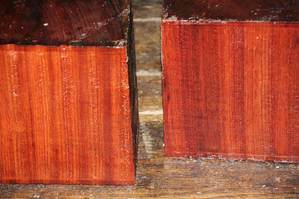 Richly colored with a density similar to Walnut. 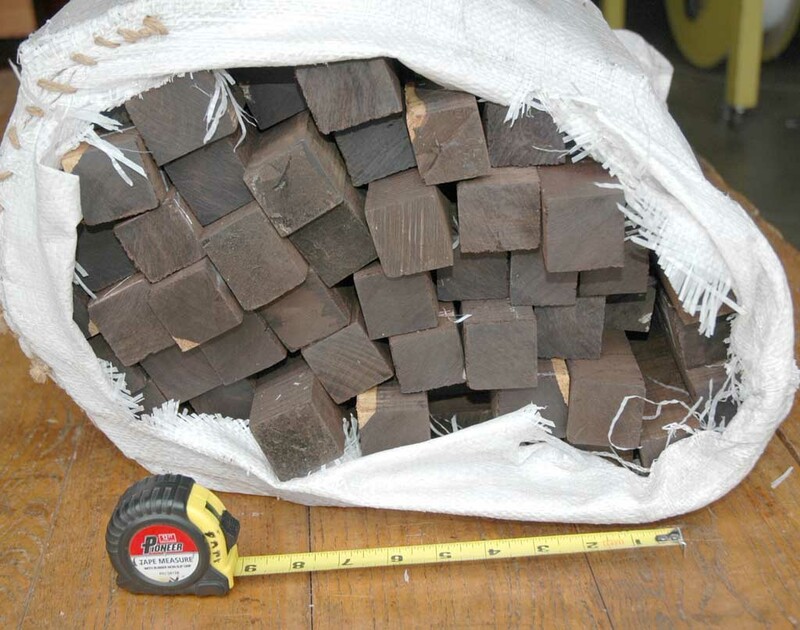 5/16-3/8 x 2 1/2-2 5/8 x 19 1/2-20 1/2"
Machiche - This dense hardwood is from Central America. 3/8 x 2 3/4 x 21-22"
Figured Big Leaf Maple - Curly or Quilted or Burly Maple from the Pacific Northwest. 2 pieces included. 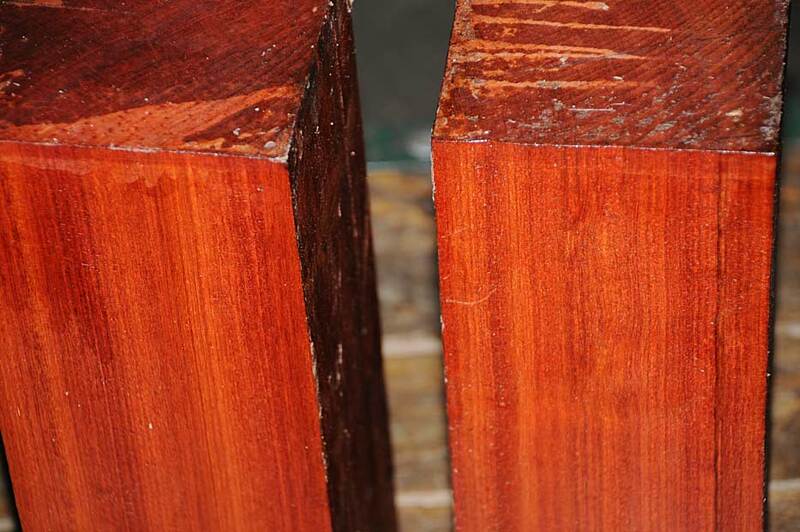 1 x 3-3 1/4 x 20-23"
Gombeira - An extremely hard and heavy wood that takes a beautiful polish. 5/16-3/8 x 4-4 1/4 x 24"
The first image shows how you will receive these pieces. 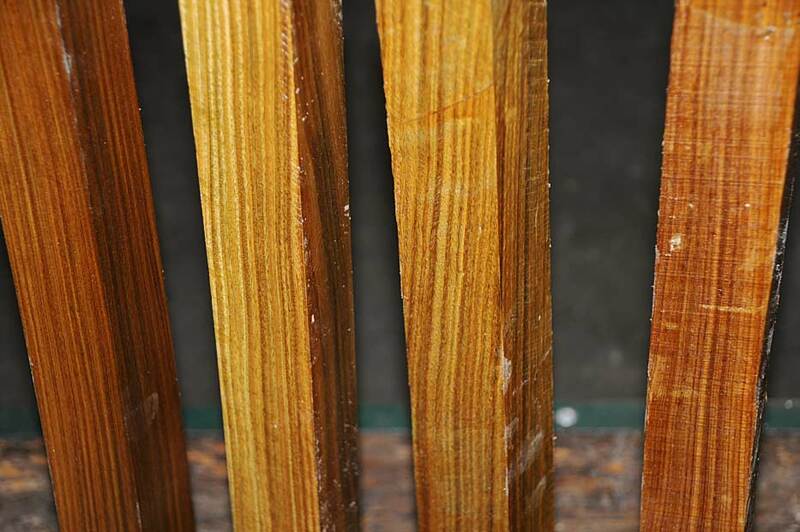 In the second photograph, we have surfaced all the pieces to show what the wood looks like in a more finished form. The pieces show in this photograph are representative of the pieces you will receive. 20 rare and exotic pen blanks. At least 12 different mostly imported species in every box. Nearly all rare and exotic species. The pieces show in this photograph are representative of the pieces you will receive, but may not exactly match the species shown. ea. pc. 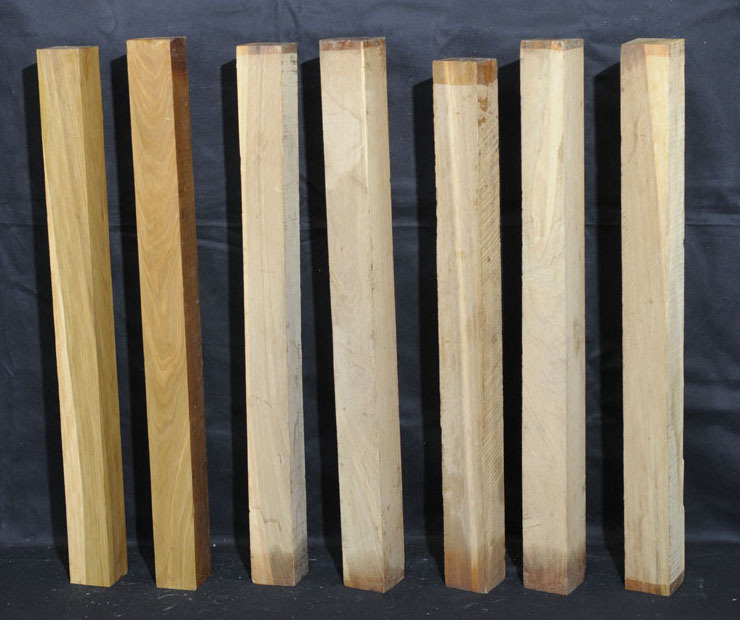 3/4 x 3/4 x 5-5 1/2"
The species we have included in this assortment were all chosen for their ease in turning. 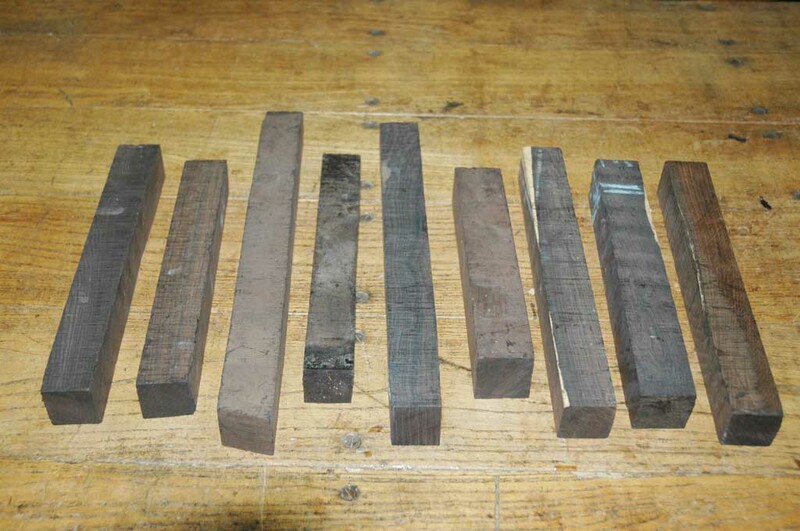 This is the perfect sampling of species for a beginning turner interested in imported woods. 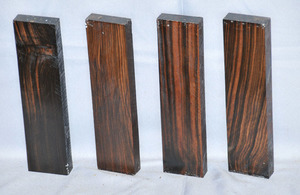 Mesquite - 3 x 3 x 5 1/2-6"
Cocobolo - 1 1/4 x 1 1/4 x 12"
Striped Ebony - 13/8-1 1/2 x 1 3/8-1 1/2 x 12"
Mexican Bocote - 1 1/2 x 1 1/2 x 12". 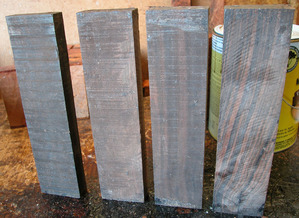 Muhuhu - 1 1/2 x 1 1/2 x 12"
East Indian Rosewood - 1 1/2 x 1 1/2 x 12-14"
If you buy 50 or more of this item, the price is $2.00 each. Call us for this pricing. 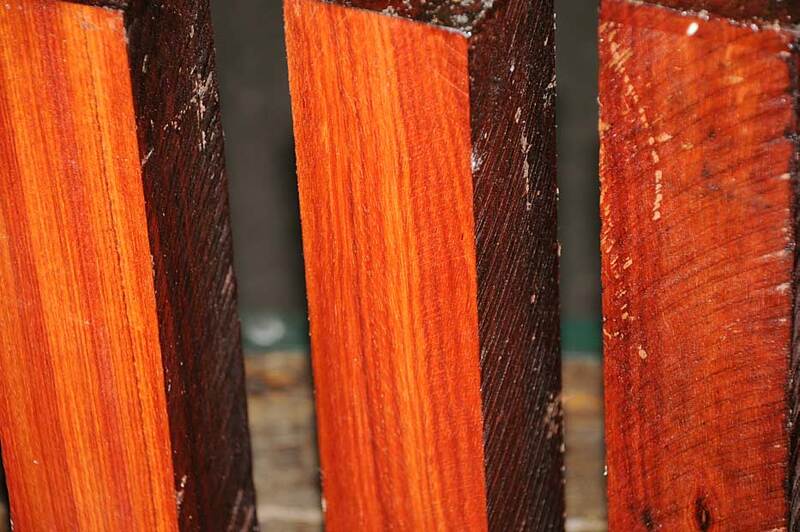 1 3/8-1 1/2 x 1 3/8-1 1/2 x 2 3/4-3"
This is grown on plantations in Indonesia where it is called Sonokeling. Excellent for jewelry boxes, drawer faces, inlays, chopsticks, and other precious objects. This is for a bundle of 50 thins. ea. pc. 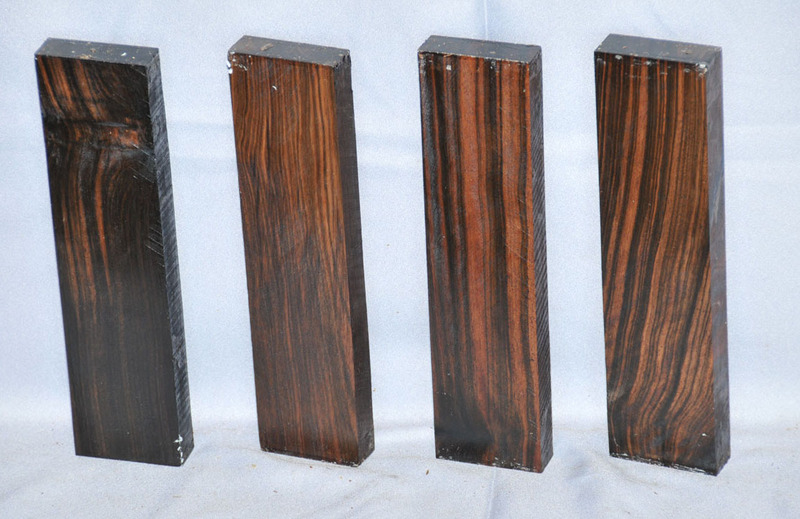 5/16-3/8 x 2 1/2-2 3/4 x 20-21"
The heartwood of African Blackwood (Dalbergia melanoxylon) is purplish to brownish-black with dark gray streaks giving an overall impression of being black. Lustrous with an attractive inner chatoyance. Very hard, heavy, close-grained, and virtually free from pores. 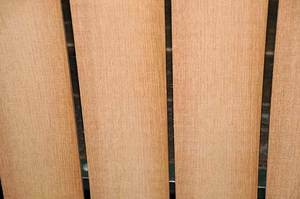 Some squares may have sapwood corners or more, burly or wild grain, occasional bug holes, small inclusions, small checks, etc., i.e. they have the small defects common to Blackwood. Still, I have milled thousands of these and have produced beautiful turning squares with many of them instrument-quality. In quantity these sell for $3.50 each. 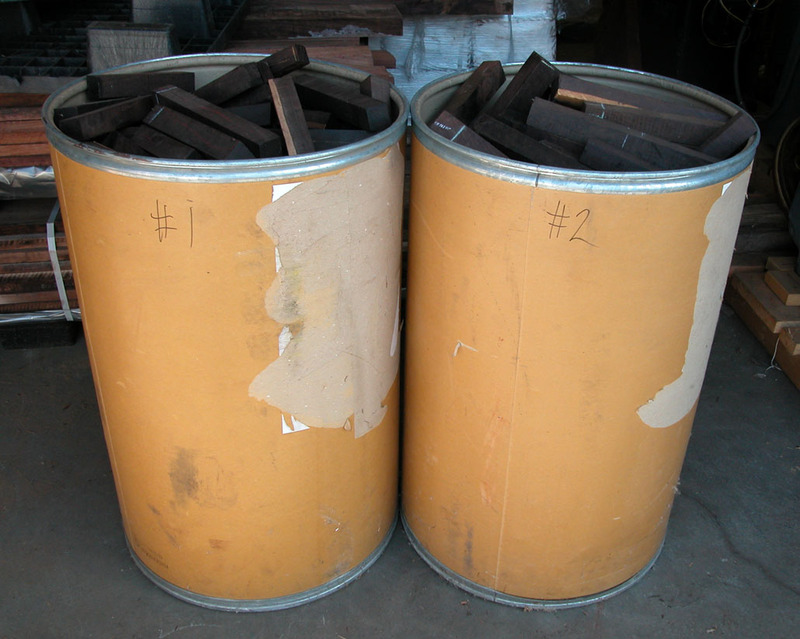 Each barrel probably contains 400-425 squares. Buy a barrel and pay $2.60 per square, almost half the regular price. When we count the squares we will kick out any that are too defected. We can usually fit approximately 400 squares in a barrel, but that will vary from barrel to barrel. Please note that while the price at checkout is $1040.00 (400 blanks x $2.60) that price may change depending on the number of squares we can fit in your barrel. ea. pc. 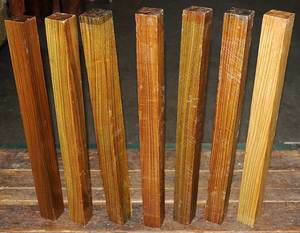 1 3/8-1 1/2 x 1 3/8-1 1/2 x 7 1/2-12"
These Banksia blanks have a lovely reddish-brown color with very distinctive, bold medullary rays which when finished are extremely lustrous. This item is for 50 pieces. x 2 3/4-4" dia. x 5 1/2-10 1/2"
Price below is per piece. Please call for discounts in quantities more than 50 pieces. ea. pc. 1 1/2 x 1 1/2 x 3 1/4"
3-3 1/8 x 3-3 1/8 x 12"
each piece 3/16-1/4 x 5-5 5/8 x 8 1/2-9"
These rare squares are from a consignment of old-growth wood that we have had for at least twenty years. Fairly hard and heavy and finishes to a nice polish. Rich & elegant looking. India. Price below is per square. 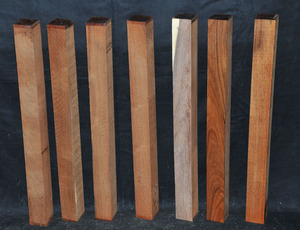 each piece 1 1/2-1 5 x 1 1/2-1 5/8 x 11 3/4-12"
The price below is per square. 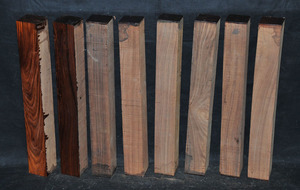 2 3/8-2 1/2 x 2 3/8-2 1/2 x 20-20 1/2"
A true rosewood, most of our stock comes from Belize. 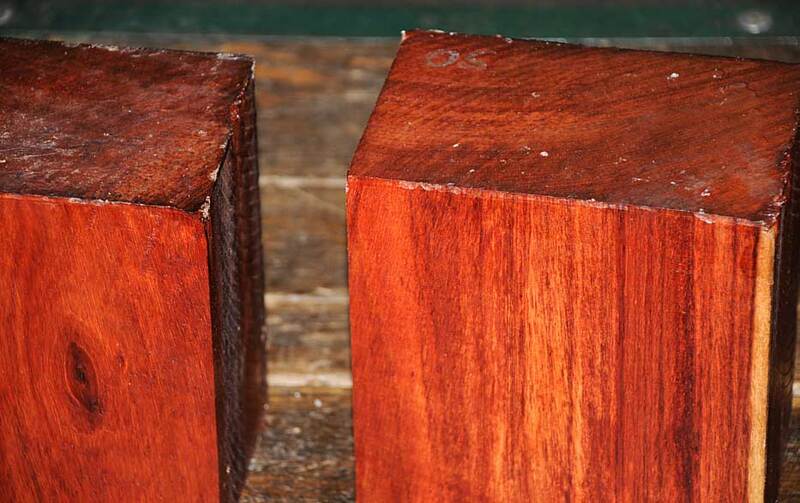 Smelling like stored apples, it is a lovely wood to turn and takes a fantastic polish. Getting scarce on the world market. U.S.A. sales only. 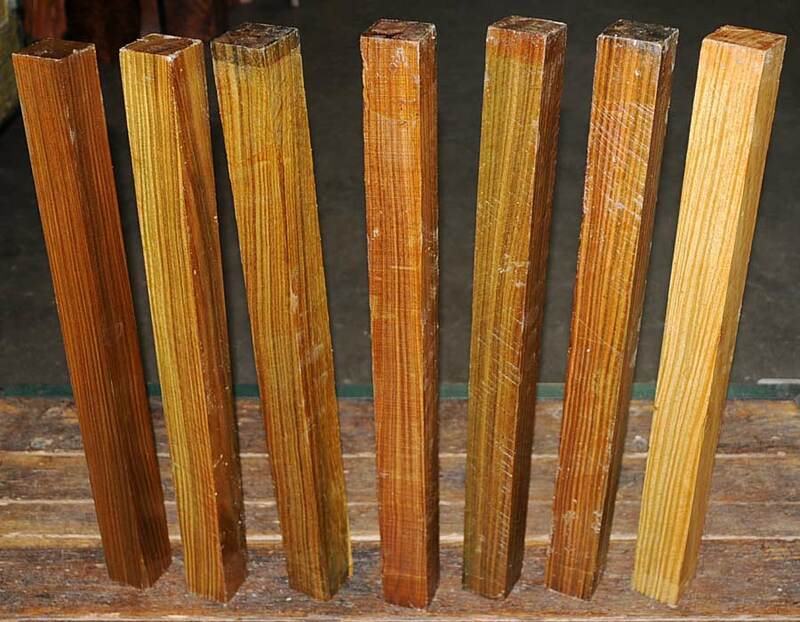 1 7/16-1 1/2 x 1 7/16-1 1/2 x 20"
A very stable wood. Air-dried. 2 x 2 x 24-24 1/2"
Also called Ibirapitanga and Pau Brazil, this once important dyewood gave origin to the name of Brazil. It is now facing extinction over most of its growth area and is listed by CITES as endangered. 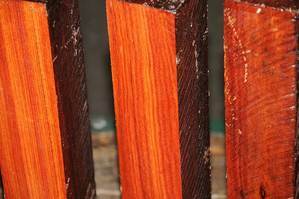 The color of the heartwood is yellowish-brown to orange and is fine-grained, hard, and heavy. Rare. USA sales only. A 1-1 1/2 x 4 x 4"
B 1 1/2-1 3/4 x 4 x 4"
C 1 3/4-2 x 4 x 4"
In one of these photos, these pieces have been surfaced and coated with shellac to show off the figure, but they are sold in the rough. 7/8-1 x 2 1/2 x 10"
The heartwood is purplish to brownish-black with dark gray streaks giving an overall impression of being black. Lustrous with an attractive inner chatoyance. Very hard, heavy, close-grained, and virtually free from pores. Its main use is in turning, and it claims the title of the finest of turnery woods, well known as the standard by which other turnery woods are judged. Long a favorite of ornamental turners, the nature of the wood allows very fine detail with sharp cutters, leaving a beautiful, burnished surface. Some blanks may have sapwood corners or more, burly or wild grain, occasional bug holes, small inclusions, small checks, i.e. they have the small defects common to Blackwood. They are an odd size to make it easier to turn the bell or flared end of a clarinet. 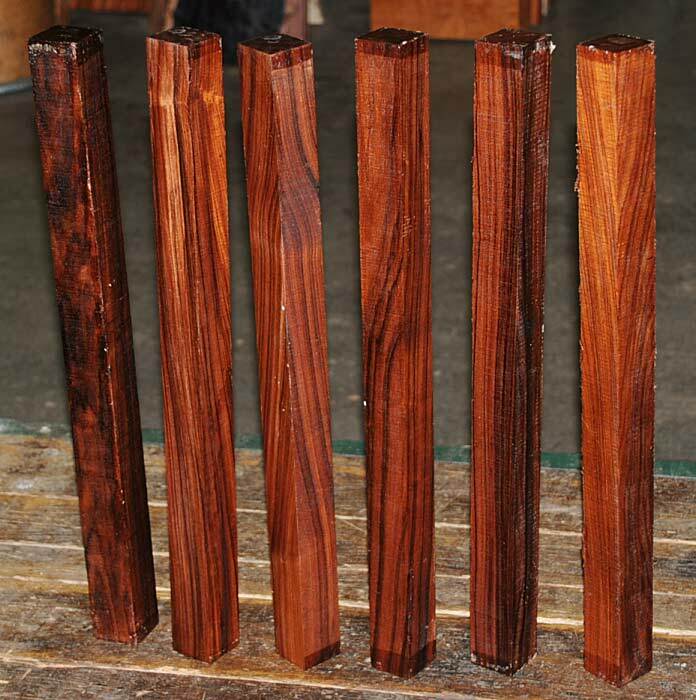 On one end they are 2 3/4-3 1/4" square and the other end is 1 3/8-1 5/8" square with tapered sides as in the photo. Length is 4 1/2-5". The above prices will not be reflected in your cart but we will change the total once shipping charges are calculated. 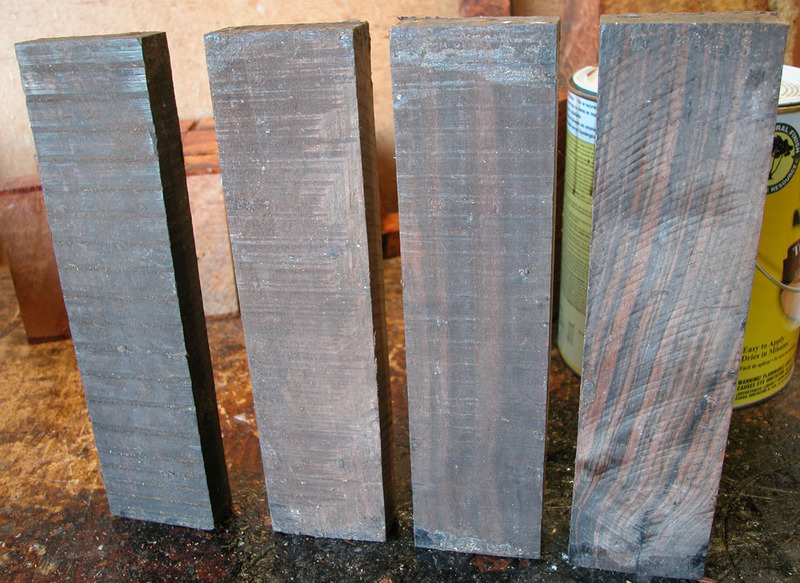 The heartwood is purplish to brownish-black with dark gray streaks giving an overall impression of being black. Lustrous with an attractive inner chatoyance. Very hard, heavy, close-grained, and virtually free from pores. Slightly oily to the touch. 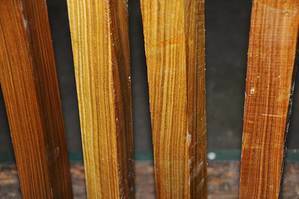 The sapwood is straw colored to a bright yellow and can be as wide as 2". 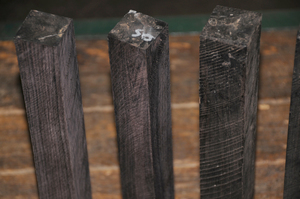 African Blackwood can weigh as much as 85 lbs per cubic foot. It is used for marquetry, inlays, knife handles, game calls, pistol grips, pool cue butts, chess pieces, jewelry, and other precious arts and crafts. But its main use is in turning, and it claims the title of the finest of turnery woods, well known as the standard by which other turnery woods are judged. Long a favorite of ornamental turners, the nature of the wood allows very fine detail with sharp cutters, leaving a beautiful, burnished surface. 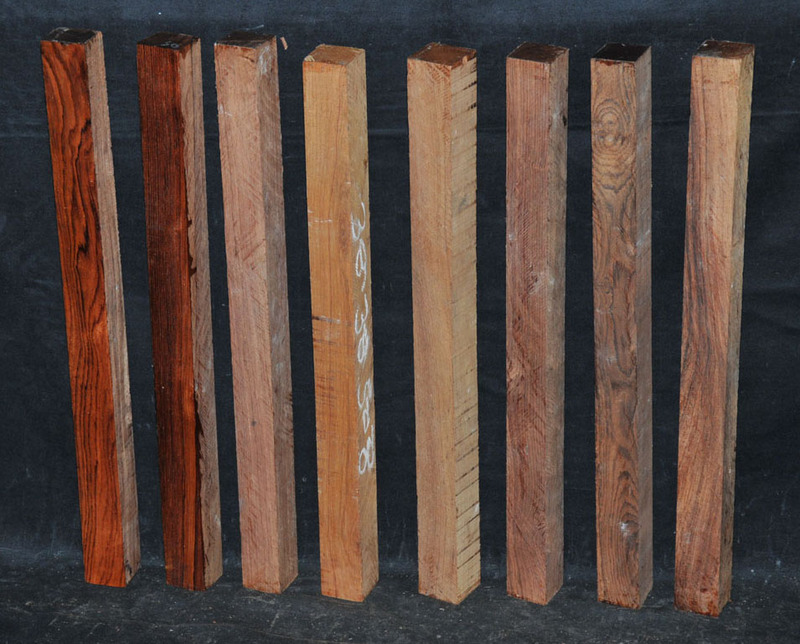 Its stability, oily nature, resistance to moisture, and lovely finishing qualities make it superior to other timbers. These are best quality squares. Rare. 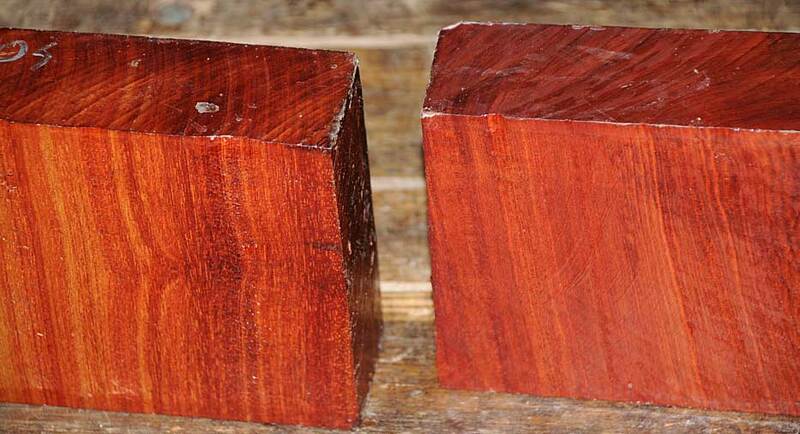 1 1/2 x 1 1/2 x 20"
This small to medium sized tree is found along the dry coastal areas of Tanzania and Kenya. 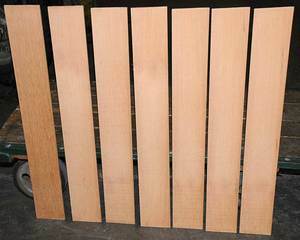 The wood is fairly straight-grained, and the yellowish to greenish-brown heartwood is sharply demarcated from the very light-colored sapwood. Texture is fine and even with an interlocked grain. The wood has an aromatic, spicy smell and the wood is distilled for its oil which is used in aromatherapy. 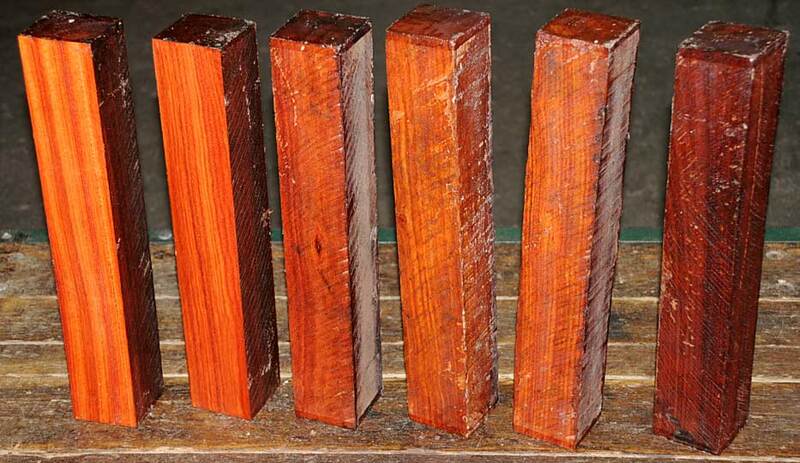 After seasoning the wood shrinks little and is very stable in service. Shapes and turns well and takes a high polish. 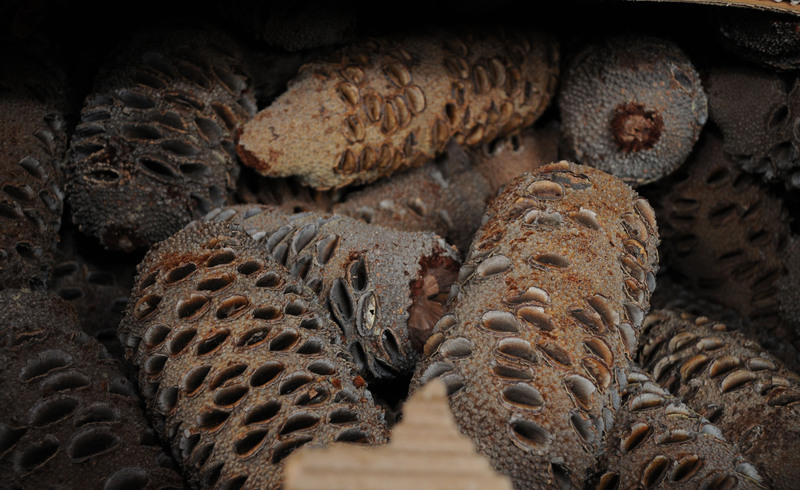 Used as a substitute for Sandalwood in India. 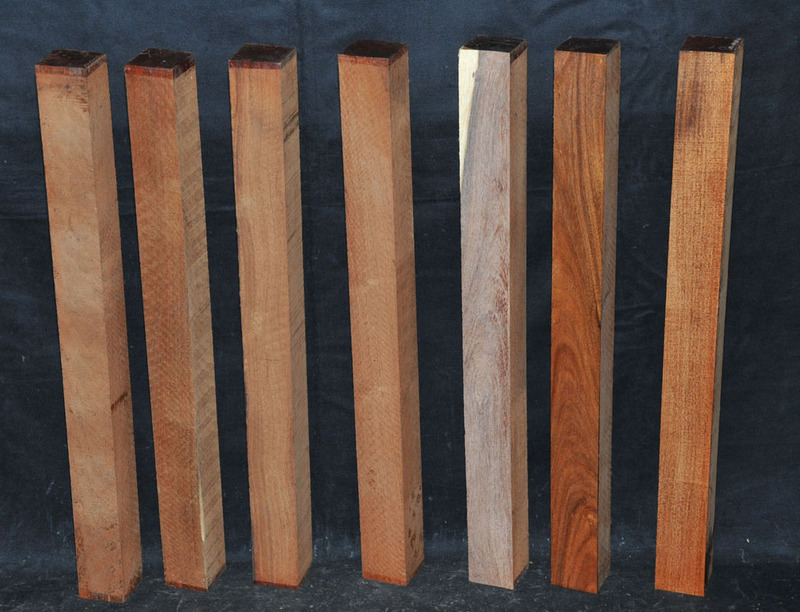 2 x 2 x 24-25"
Bois de Rose is a true rosewood from Madagascar and is little known on the world timber market. It is a deep burgundy color, sometimes with darker striping and darkens on exposure. It is hard and heavy and takes a high, glassy- smooth polish. 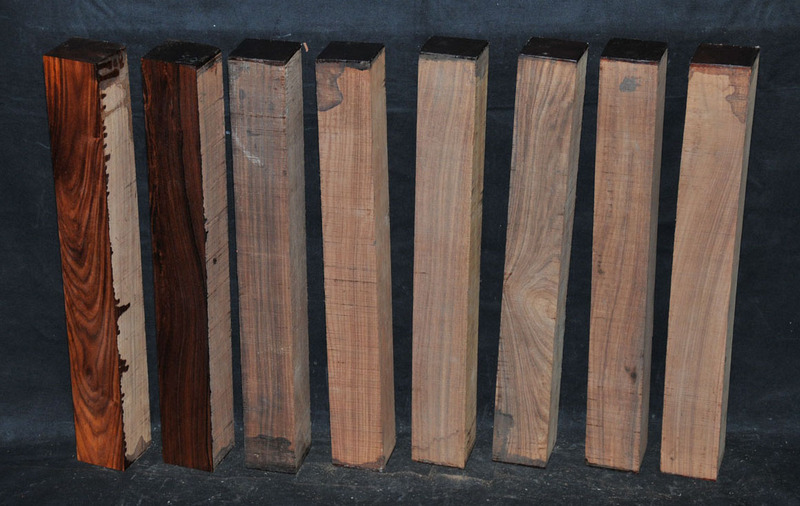 This wood has a tap tone more like old Brazilian Rosewood than any other species we have cut. 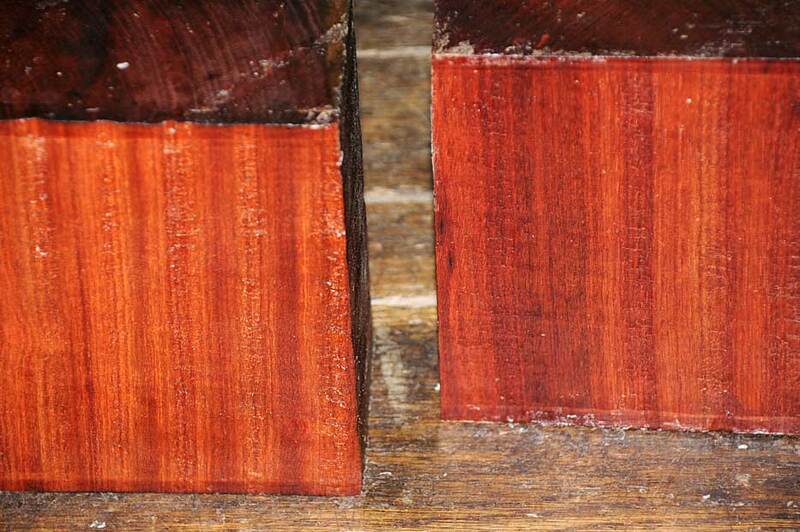 Bois de Rose is one of the rarest in the rosewood family. We have a very limited stock of this beautiful wood and when it is gone we will not be able to replace it. Air dried. 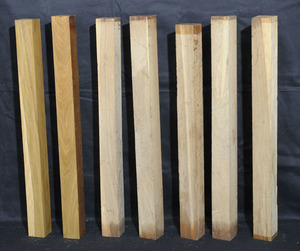 each piece 11/16-3/4 x 2-2 1/4 x 12-12 1/2"
These are rough, not surfaced squares. Top grade. Price below is per square. 1 1/2 x 1 1/2 x 12"
1 7/8-2 x 1 7/8-2 x 12"
These squares are rough and haven't been surfaced yet. 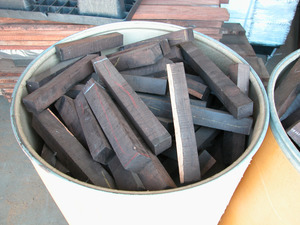 1 15/16-2 x 1 15/16-2 x 23-24"
We have in stock a large quantity of African Blackwood or Grenadillo squares from East Africa. 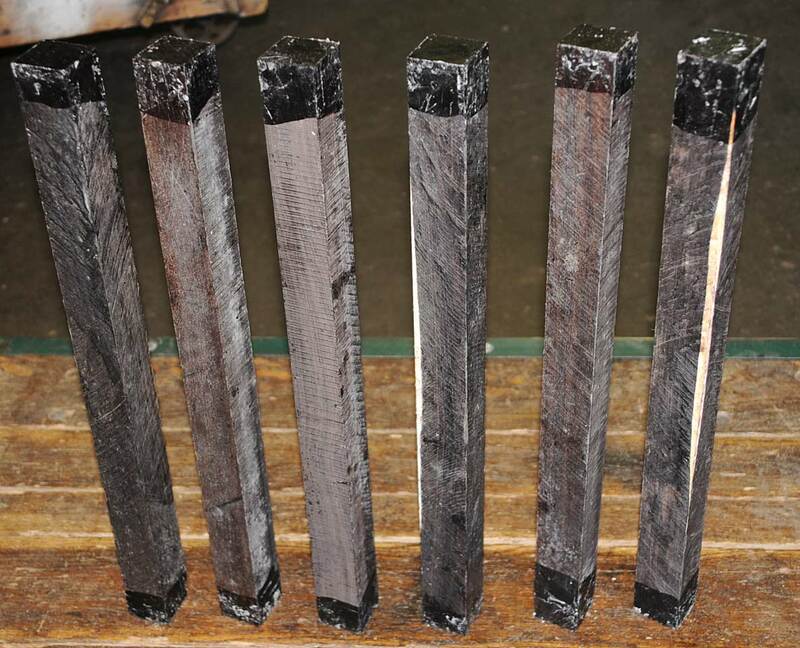 They are all roughsawn just as the mill produced them and range in size from approximately 1 3/8 x 1 3/8 up to 1 5/8 x 1 5/8 with lengths of between 7 and 15 inches. 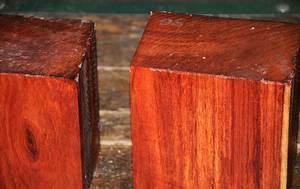 Some squares may have sapwood corners, burly or wild grain, occasional bug holes, or small inclusions, i.e. they have the small defects common to Blackwood. I have milled thousands of these and have produced beautiful turning squares with many of them instrument-quality. In quantities of less than 50 pieces they are $7.00 each. To add additional squares to your cart, simply change the quantity field in the shopping cart to reflect how many you would like and press the "update cart" button. We have in stock a large quantity of African Blackwood or Grenadillo squares from East Africa. They are all roughsawn just as the mill produced them and range in size from approximately 1 3/8 x 1 3/8 up to 1 5/8 x 1 5/8 with lengths of between 7 and 15 inches. 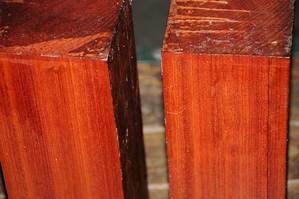 Some squares may have sapwood corners, burly or wild grain, occasional bug holes, or small inclusions, i.e. they have the small defects common to Blackwood. 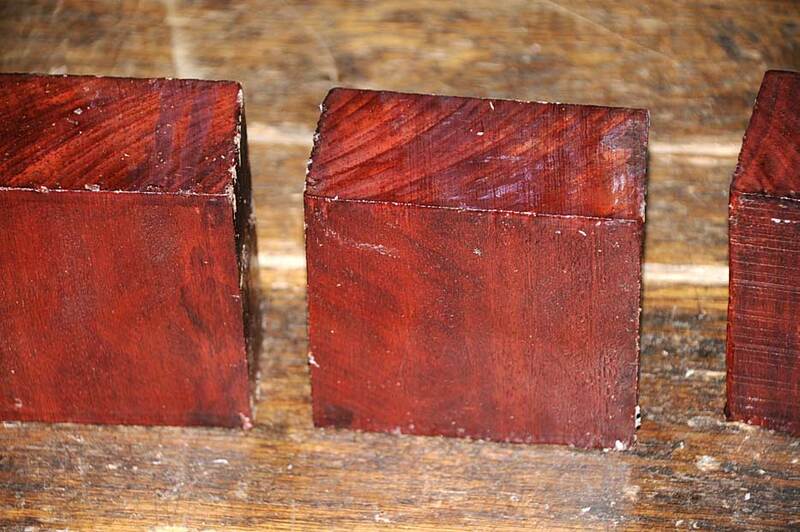 I have milled thousands of these and have produced beautiful turning squares with many of them instrument-quality. They arrive in bags weighing between 60 and 70 lbs. Buy a bag and save $$$. We will kick out any that are too defected and box up 60 pieces for $255.00. That is only $4.25 per piece. For larger quantities call us for prices. The price below is for 60 pieces. To add additional bags to your cart, simply change the quantity field in the shopping cart to reflect how many you would like and press the "update cart" button. The price below is per piece. To add additional pieces to your cart, simply change the quantity field in the shopping cart to reflect how many you would like and press the "update cart" button. 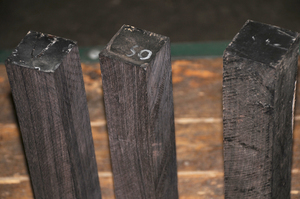 1 1/2-1 5/8 x 1 1/2-1 5/8 x 20 1/4-20 3/4"
This Ebony is unsurpassed for its beauty and blackness. It is fairly fine-textured and takes a high polish. Rare. When this is gone, you will never see it again. 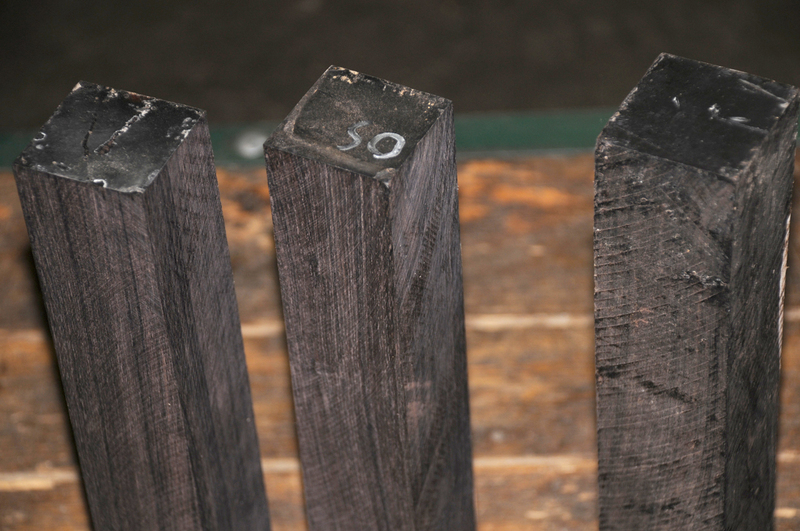 1-1 1/8 x 3-3 1/4 x 12-12 1/2"
This Ebony is unsurpassed for its beauty and blackness. It is fairly fine-textured and takes a high polish. Rare. 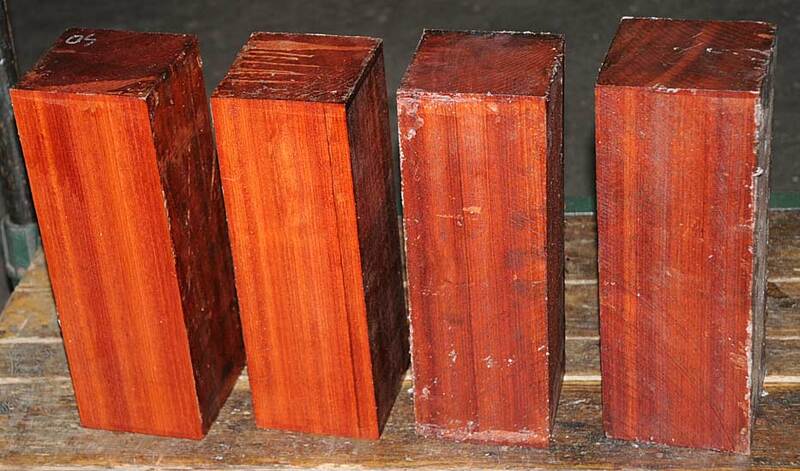 7/8-1 x 4-4 1/4 x 13 1/2-14 1/2"
Also called Satine, Cacique, and Cardinalwood. 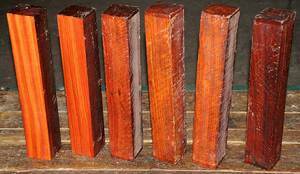 The heartwood is a rich strawberry red, in sharp contrast to the light colored sapwood. Takes a high, lustrous finish. Air dried. The price below is per blank. To add additional blanks to your cart, simply change the quantity field in the shopping cart to reflect how many you would like and press the "update cart" button. 2 3/4-3 1/4 x 6 1/4-6 1/2 x 6 1/4-6 1/2"
2-2 1/8 x 5-5 3/8 x 5-5 3/8"
1 15/16-2 5/16 x 3 7/8-4 1/4 x 3 7/8-4 1/4"
4 1/8-4 5/16 x 4 1/8-4 5/16 x 12 1/8-12 3/8"
4-4 1/4 x 6-6 1/2 x 6-6 1/2"
2 1/2 x 2 1/2 x 15"
Perfect for lining humidors and other boxes and chests. The price below is for one piece. 1/4-5/16 x 4-4 1/4 x 30-30 1/2"